Coming down heavily on PM Modi, Gandhi said he has 'failed' to fulfil the promises made during the last five years. 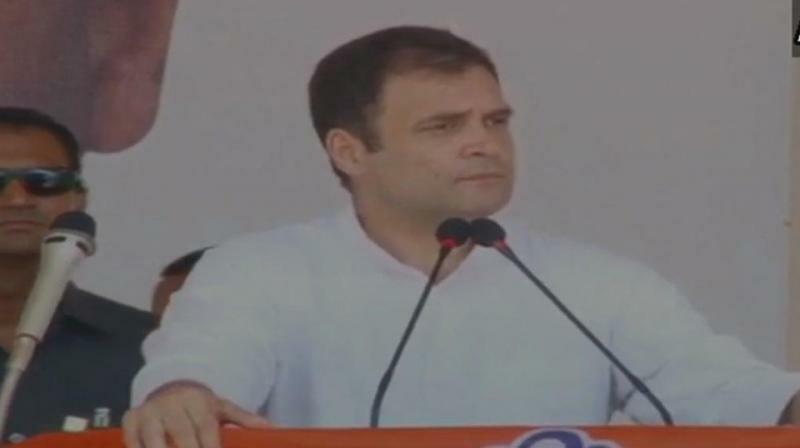 Kollam: Addressing a poll rally in Kerala’s Kollam, Congress president Rahul Gandhi said that normally he fights the election from Amethi but this time he chose to give a message to south India by fighting from Kerala. Coming down heavily on PM Modi, Gandhi said he has "failed" to fulfil the promises made during the last five years. "The promises Modi has given to you, he has not fulfilled but Anil Ambani gets Rs 30,000 crore in Rafale deal. The Prime Minister is speaking of nationalism and he gave the biggest defence deal to a person who has not made a single aircraft," Gandhi charged. "In the last five years, our Prime Minister promised several things. Two crore job opportunities.. Rs 15 lakh deposits in bank accounts and price support for farmers," he said. Gandhi asked the people how many of them had received the money in their bank account promised by the Prime Minister. Gandhi assured the cashew farmers in the state that his party, if voted to power, will to take up their cause. "We will start a conversation to help make cashew growing a viable alternative", he said adding that it was an "honour" for him to fight elections from Kerala. Rahul Gandhi arrived here last night on a two day visit to Kerala. Besides Kollam, he would address rallies in three more districts.